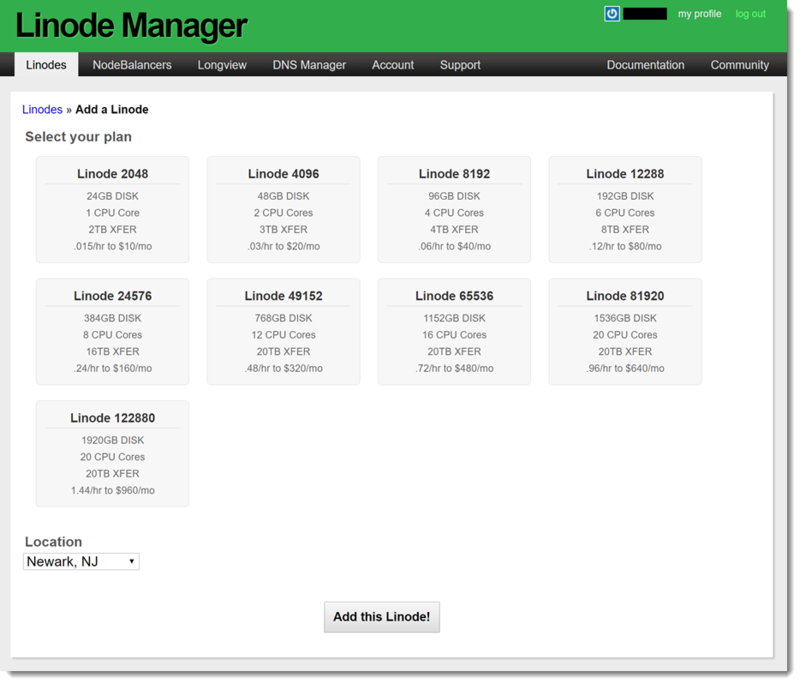 First, let's sign you up on Linode so that you can create your own disposable Linux servers quickly and easily, in the cloud. Before you get started, make sure you know which email and credit card you plan to use for this. 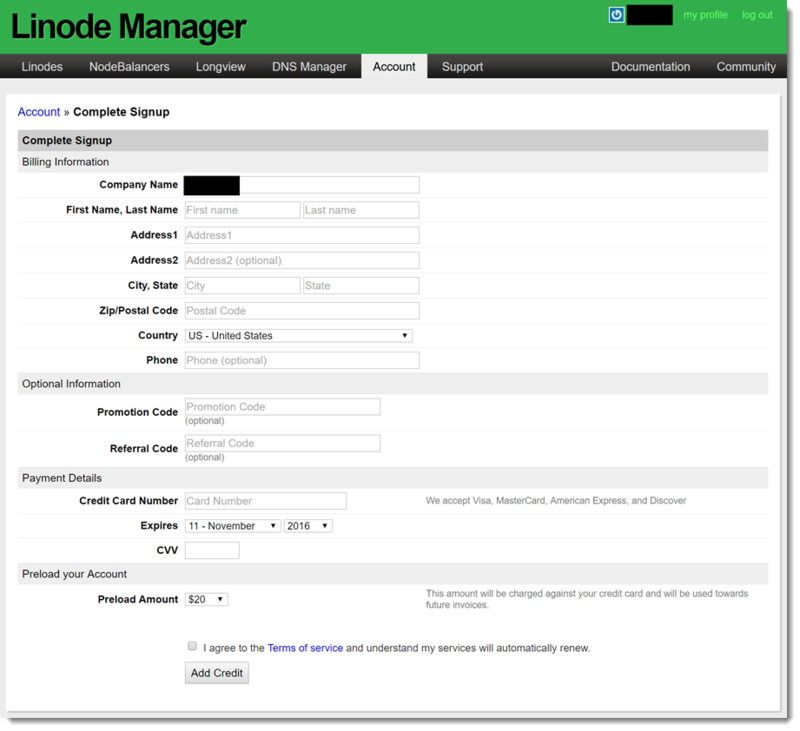 Go to https://www.linode.com/?r=e77eccc94763d33e700c5c873587c031475e426f/ and click the "Sign Up" link in the top right, or, fill out the form right on the page to create your account. Your username may only contain letters, numbers, dashes, and underscores and must begin and end with letters or numbers. Your password must be at least 6 characters. After you get past the sign up form, you will see this next message. Go check your email and click the confirmation link. And then the following screen. Next click the button to finish setting up your account. Note the money back guarantee. You will come to a form that you need to fill in. By default, you will load your account with $20, however, you can go as low as $5 for the preload amount. Do not forget to check the "I agree" checkbox. Please make sure that the Referral Code is "e77eccc94763d33e700c5c873587c031475e426f". Hunting for a current Promotion Code might also be worth a couple of minutes of your time. Note that if you are just trying this out, you can get away with the $5 initial amount. Your credits will not deplete if you do not have any machines running, so don't worry. We'll be creating machines in the next tutorial, and it will be very clear how much they cost on a prorated monthly basis. The Terms of Service are not scary; they are actually perfectly reasonable, and what you would expect. Once you click the Add Credit button at the end of the sign up form, and get past any errors in your input, you will be in business! You will see a message like the one below, and it may take them just a few minutes to review your account, as the message says. After those minutes, you should be able to click on the "Linodes" link in the top left and not see this message. Once you navigate to the Linodes page, you will see some options. 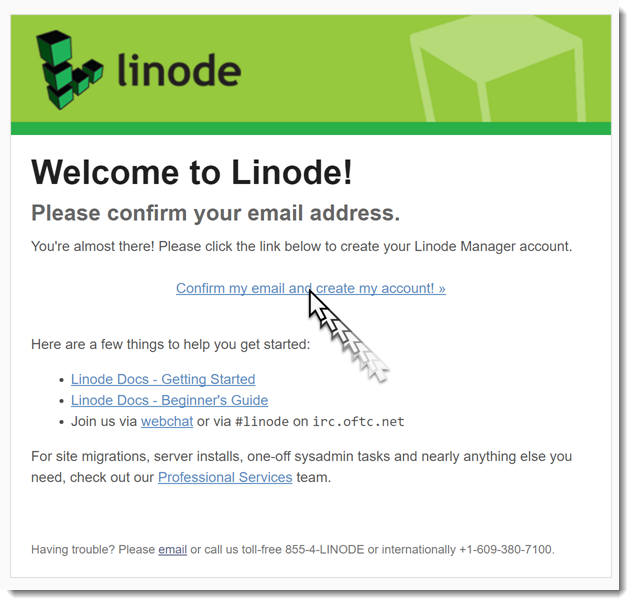 Now, either explore machine creation on your own, or continue with our next tutorial: How to Create an Ubuntu Linode.